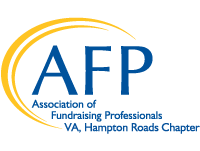 The Association of Fundraising Professionals Hampton Roads (AFP-HR) Chapter was founded in July of 2001 to provide professional education, career development and growth of fundraising professionals in the region while promoting high ethical standards and collegiality for those in the fundraising profession. The scholarship covers a one year AFP membership. The awardee will be required to attend 70% of the monthly meetings and actively participate on a committee. The AFP-HR meetings are held on a monthly basis on the second Tuesday of each month at the Town Center City Club (222 Central Park Avenue #230, Virginia Beach, VA 23462). Applicants must be a newcomer to fundraising and should attend all AFP-HR meetings if selected as the winner. Winner may not transfer award to another recipient. Applications should be emailed to: admin@afp-hr.org. For questions call Homer Babbitt at 757-664-1046.